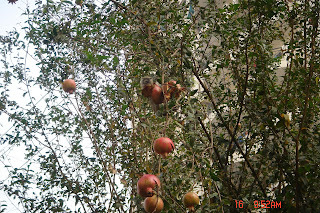 The Anaar tree which bears the Anaar (Pomegranate) fruit is valued in Ayurvedic and Unani systems of medicine. 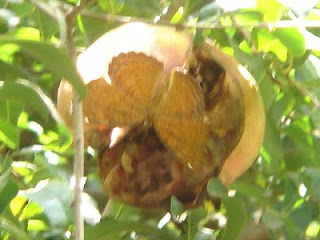 The fruit and its rind have nutritious values and healing properties. 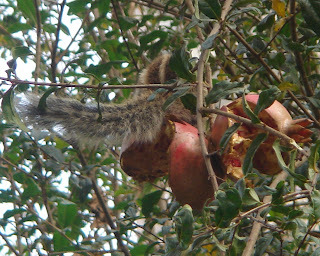 The pomegranate is native to the region of Persia and the Himalayan ranges of India. It grows well in the NCR region. 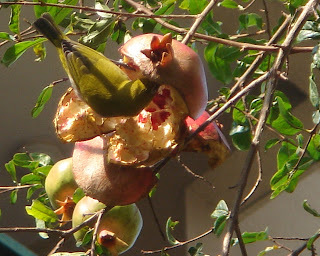 The bird community seems to realize the value of the pomegranate fruit. 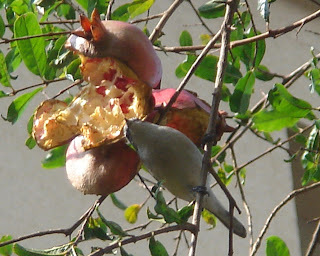 Of all the plants and bushes in my garden, the Anaar attracts quite a few birds at all times. 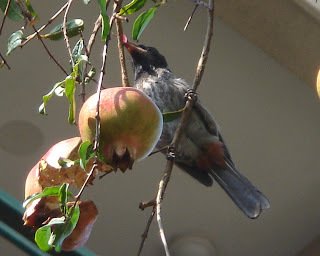 The soft spoken "white eyes" and the chirpy "bulbuls" relish the red fleshy seeds. The squirrel, evening brown butterfly and common Castor butterfly are the other regulars I have observed at various times. This winter we have not had many butterflies in the garden; may be because it has been a dry winter with no signs of rains coming. 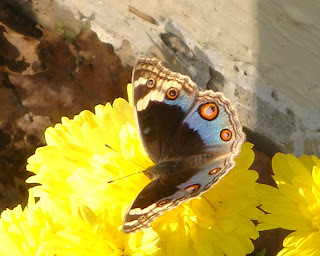 So I was thrilled when the blue pansy flitted about under the morning sun. 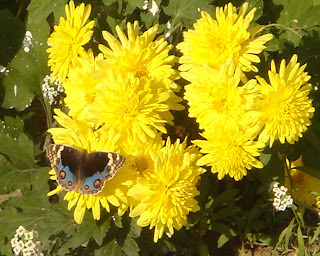 First on the yellow chrysanthemums and then on the Asoka Tree. 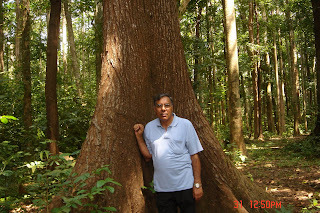 A visit to Kerala is never complete without a peek into the deep forests the State can still be proud off. Waiting nearly two hours to get permission to drive through the Illithod Mahagony Forest was forgotten once our vehicle entered this near pristine forest. 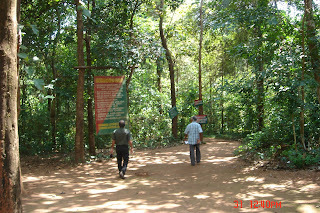 Till recently, we were told, the access to the forest was unrestricted and the area was a favourite with plastic throwing tourists. The State forest department stepped in and went a step further. 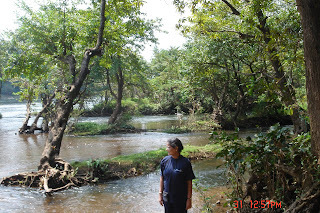 They managed a court stay on the Aquaduct which was being constructed on the banks, parallel to the River Periyar. The completeion of this canal would have meant no access for the animals to the river. For now the animals are happy! 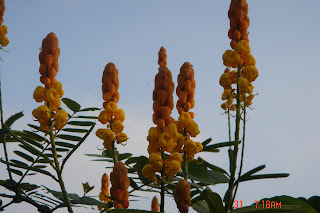 candle flowers grow wild on the roadside entrance to the mahagony forest canopy of mahagony leaves an enveloping tree trunk Periyar River (300km long) flows through the dense forest floor. 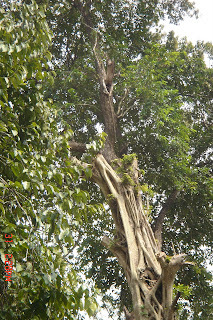 strangler figs abound (thanks to abundant bird life) the mahagony survives and grows, unstrangled! 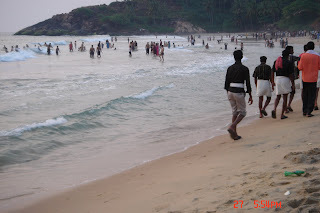 Kovalam beach is a favourite with tourists for swimming in the sea. There are coast guards around who keep a watchful eye. The beach is advertised as ’jelly fish Free’ on the various travel sites. 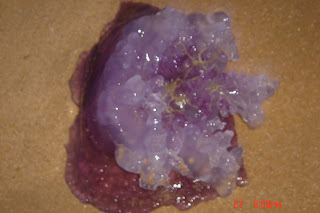 So it was a surprise to find large number of purple jellyfish being washed onto the shore by the waves. The coast guards assured us they are dead and harmless. The fishermen throw them out when they get caught in their nets. It seems there is a migration of jelly fish for about a fortnight in October, when the sea gets foamy with the gelatine in the jelly fish. Kovalam beach never fails to arouse curiosity! Squids which made jelly fish their home, were seen crawling inside and attracted other beach goers. I am sharing a small clip uploaded in ’wildbytes’ channel of youtube. Elinor Ostrom and Oliver Williamson win Nobel Prize for Economics 2009 on Monday. This year the rains came late and lingered till end of August. The butterflies and moth caterpillars waste no time in completing their life cycles; Here are some I managed capturing on the lens, in the beginning of September. 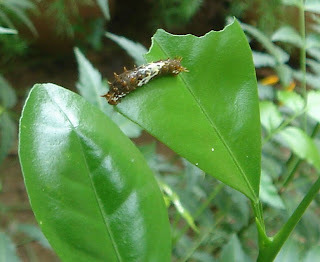 The above picture is that of a lime butterfly caterpillar which is probably in its third stage (instar)of moulting. 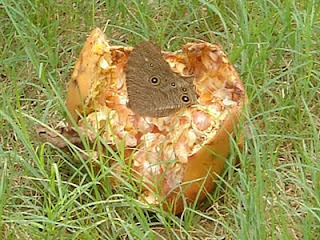 The picture below is that of the same caterpillar after two more moultings. 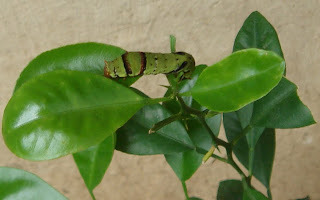 Now it is in its last ’instar’ and the next stage will be the pupa and then the lime butterfly. 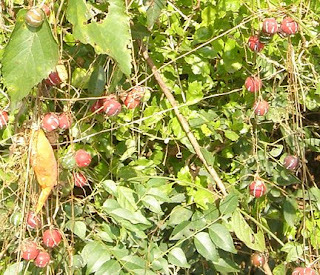 The host plant is the Chinese Orange tree. 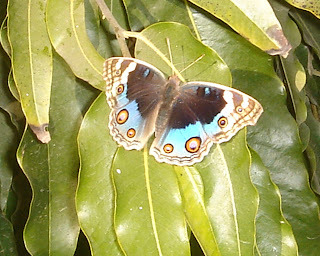 If the caterpillars of lime butterfly are fast eaters, they pale in comparison with the moth caterpillar’s eating capacity. 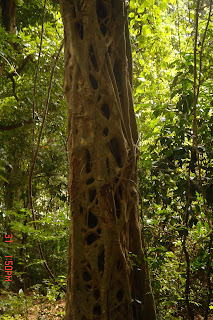 The picture below is that of the Elephant Yam moth caterpillar. 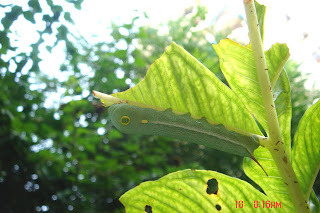 This one could devour huge leaves of the yam plant overnight and was found hiding beneath the leaf during the day. I could not observe this caterpillar in its next stage; probably a mynah or babbler found this packaged fast food irresistible. The caterpillar disappeared sometime during the day. I was in Kangra (Himachal Pradesh) late October, just before winter set in. As always, the countryside is ever changing and never fails to reveal something new for my camera to capture. The mongoose family scurrying about the neighbour’s vegetable fields was amusing. So was the sight of giant wood spiders alongside walking paths. The females are nearly ten times larger than the males, I believe. They weave the strongest and largest spiderwebs known to us. Shiny legs with yellow joints are their hallmark. Giant wood spiders are the subject of research- Humans would love to know the secret of creating the strong golden websilk. "In modern times, the Golden Orb Web Spider’s silk is set to become a major product. The silk is almost as strong as Kevlar, the strongest man-made material which is drawn from concentrated sulphuric acid. In contrast, spider silk is drawn from water. If we could manufacture spider silk, it would have a million uses from parachutes, bullet-proof vests, lightweight clothing, seatbelts, light but strong ropes, as sutures in operations, artificial tendons and ligaments. Studies are now being done to have genetically engineered plants produce fluid polymers which can be processed into silk". The wild red and white berries were all over. 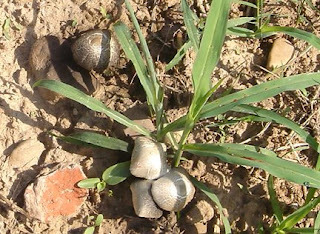 The fields had spawned metallic mushrooms which vied with the pebbles lying around. 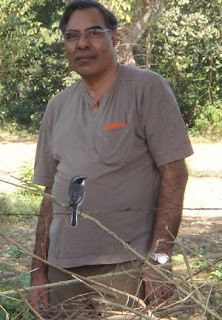 My husband was only too pleased to pose for a photo, framing a wagtail which he was pointing out to me! More on my next visit! 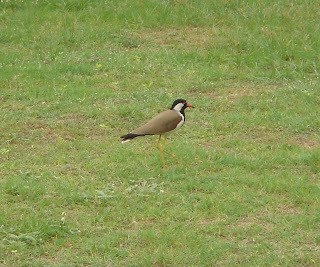 The red wattled lapwing is a regular visitor to our neighbourhood park. 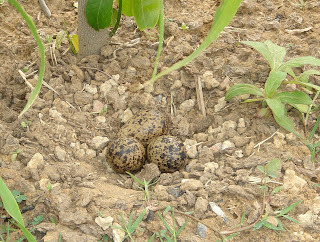 So I was thrilled to see three spotted eggs on the ground on 5th June. The eggs were laid in the centre of the Park which sees morning walkers doing their rounds every day (who would not notice the eggs anyway) and young children playing football and cricket in the evenings. To protect the eggs the bird had laid the eggs underneath a tree-guard. On 9th June, I went to check on the eggs. There was no one in the Park. But I was delighted to see two small chicks with their mother. The mother noticed me as I was still at the gate and started alarm calls. The pitch went higher and higher as I tried to go close. The chicks scampered in one direction while the mother went in another. Soon the father lapwing appeared on the scene and started shrieking. Then, an amazing thing happened. The chicks suddenly disappeared in the grass and made themselves invisible. Almost simultaneously, sparrows and Indian robins started flying around the area even as the parent lapwings held on to their spots. I was mesmerised by this amazing act of community feeling! Needless to say I had to return without a photo. I could not help but feel moved enough to write this blog! Sunderbans is the world’s largest delta formed by the river Ganga. 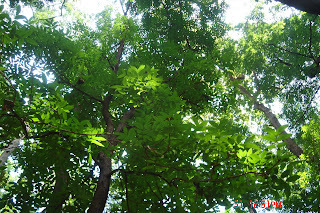 Sunderbans comprises 54 tiny lands at present and a number of tributaries of the river Ganga crisscross Sunderbans. Ghoramara island in the Sunderbans is shrinking due to the rising sea-level. Ghoramara has shrunk from 9 square kilometres to 4.5 square kilometres in the past 30 years as rising sea level and constant erosion of embankment has already uprooted 7,000 inhabitants leaving another 7,000 in a state of constant fear. The biggest island, Sagar which hosted refugees from other islands all these years is witnessing massive erosion now. 70,000 people in the 9 sea-facing islands are at the edge of losing land in next 15 years. For these people climate change is real. “Mean Sea Level”, a documentary made by CSE depicts the threat of erosion the island faces in the wake of rising water levels. The Union ministry of environment and forests is reportedly preparing measures to protect Sunderbans, the largest mangrove block in the world. According to a report in Business Standard, short-term and long-term measures for protecting the ecology of Sunderbans would have to be taken. Venice, which rests on millions of wooden piles pounded into marshy ground, has sunk by about seven centimetres a century for the past 1,000 years. The earth’s natural underground water supplies acted as a cushion that helped slow the city’s sinking. Venice and its lagoon was added to UNESCO’s World Heritage list in 1987. The following news item which appeared in The Hindu today, should make all of us sit up and take notice. Conservation is the most complex subject-It is only when environmentalists and the common man ( here the fishermen) sit together, can solutions emerge. Otherwise the reactions are bound to be knee-jerk. Or at best imported from a situation elsewhere, where the realities might be very different.